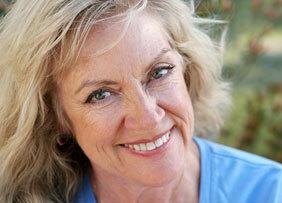 Periodontal simply means "the tissue around the teeth." Periodontists specialize in the treatment and surgery of this area, which is often characterized by gum disease. Plaque and tartar are the most common elements that cause gum disease, which ranges from mild (gingivitis) to severe (periodontitis). Treatments are available for every case of gum disease at the Camden dental practice of Drs. Moss and Owen! Unfortunately, periodontal-related problems are often only discovered after they have persisted for an extended period of time. Proper oral hygiene, daily home dental care and regular dental checkups will minimize the risk of gum disease and visits to periodontal specialists. The effects of gum disease can be damaging not only to your dental health, but to your overall health as well. Periodontal structures provide the foundation for your teeth. Restoring teeth in poor periodontal health would be the equivalent of building a house on a weak foundation. Through regular preventive care and oral hygiene, you can avoid problems associated with gum disease. Please contact our Camden office to schedule a periodontal evaluation!